I have this habit of doing all of my deep cleaning in the fall before the holidays. This year my goal was to tackle the "junk" closet. I'll be honest, I've been kind of dreading it. I kept putting it off and stacking more and more junk in there and finally I could hardly open the door without stuff falling out. It was way, way past time to get it cleaned out. Finally I got around to it. One of the things I keep in this closet are boxes of old pictures and school papers and stuff. I started going through each box and pretty soon I realized, that although I haven't been very consistent on anything in my many years as a mom/wife, the one thing we have done is taken a picture each Halloween and made Christmas cards each Christmas. But here they were stacked in a box, years and years of pictures and cards neatly tucked away. I wanted them out. I wanted my family to enjoy them. I remembered a couple of years ago when we took the kids to Disneyland, we had made our own autograph books. They were super easy and so cute. Plus the pages were nice and thick and they were very sturdy. 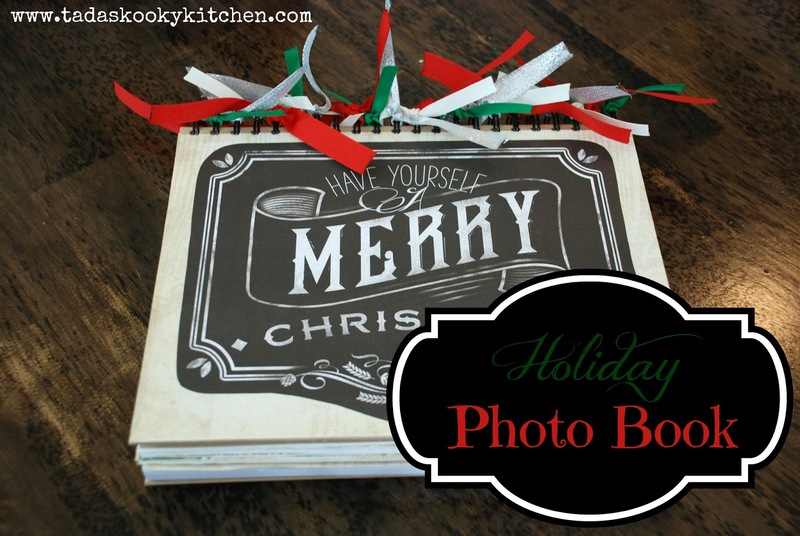 I thought that method would be perfect for making some super easy holiday photo books. The sketchbooks from Barnes and Noble are perfect for this project. The pages are thick and durable, and they are acid free to protect your pictures. They come in all sizes and start at $3. Plus they have lots of pages in them so you can add to them for many years to come. Take the scrapbook paper and cut a piece out that is the same size as the front of the book. Use the glue stick, glue the paper to the front cover. Use any other decorations you want at this time. Then do the same for each page. 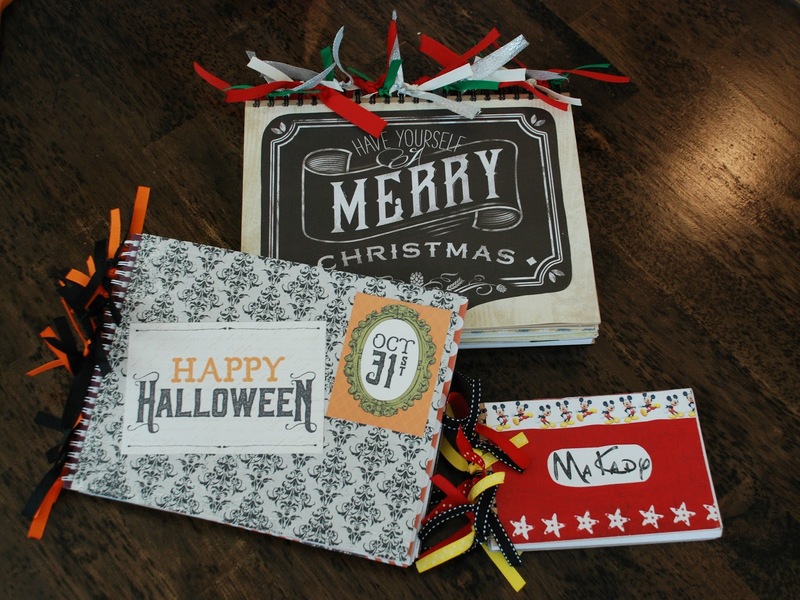 Glue in a piece of scrapbook paper, then use the photo corners to attach each picture and card. You can hand write the year if you want (I printed mine on the computer, then glued them in). Use your creativity and imagination. To finish up each book, cut a strip of ribbon, long enough to tie in a knot and have a little hanging out about 2 inches past the edge of the book (this will vary depending on the size of your book and the look you are going for). Melt the edges of the ribbon with a lighter to seal the ribbon and stop the ribbon from fraying, Then tie the ribbon on the spiral part of the sketchbook. That's all. Easy! Each book took me about an hour. But my kids have loved these books so far. They have pulled them down off the bookshelf several times now. 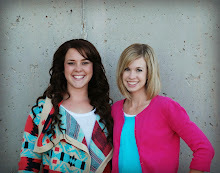 It's been fun to have our pictures available for them to look through and remember little stories from each year.